Have fun and meet other young professionals through IGNITE - the Chamber's Young Professionals + Network. Low key but high energy, IGNITE meets monthly for happy hour and networking. All are welcome to attend - those in the "young" age bracket and certainly, those young at heart! Don’t miss the August IGNITE! 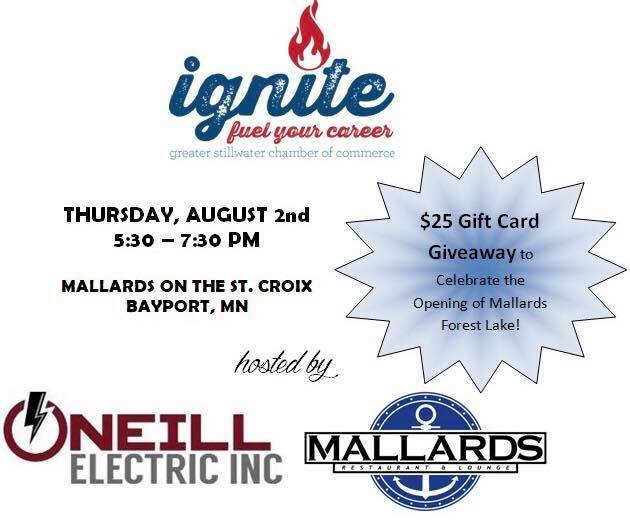 Hosted by O'Neill Eletric Inc. and Mallards on the St. Croix! Mingle & Connect with fellow Chamber members. There will be a $25 Gift Card Giveaway to celebrate the opening of Mallards Forest Lake! Be sure to sign up!